I just got my Yellow Collard Macaw, last Sunday. I know the feeling of stepping into this field. I have massive data to learn myself and will not shy from it. My Rio is doing well, considering the previous owners abuse of her. Get your cage and toys , food first. Then make a decision on the type of bird. It takes a long time to learn about them. I spent 2 weeks researching and found little that was for my bird. Others here and elsewhere have filled in some of the blanks. Just got for it, you will love raising your bird. I'm sure you can make it work if you really tried. people here are way too sensitive about bird keeping. people in 3rd world countries (which is most of the world) keep birds in what people here would consider "atrocious" conditions and are probably just as healthy. just my 2 cents. good info here, just don't let others discourage you from doing what you consider possible. And thank you for this Although I do understand where everyone is coming from, I know it's possible... So thanks for the reassurance! Wow, just last Sunday? It's nice to have advice from someone who's has extremely recent experience! Any recommendations for me specifically? 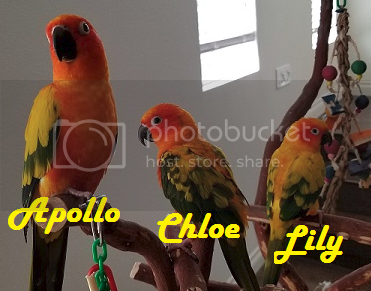 The only birds that are ever available for me to meet are conures, so i currently have no experience with Caiques, Cockatiels or Ringnecks. Marrmarr, I don’t think you understand. Parrots have DIED as a result of this arrangement, have been horribly neglected as a result of this arrangement. Mine included. And the rate of rehoming is astronomical, and wholly unacceptable. We have a obligation to be the best stewards we can be for these animals we’ve forced into our homes. An ounce of conservatism is absolutely warranted. MGMork, 18 is square in the age range we’re concerned about, and right around where most of us assumed you are, given the age of your younger brother. Now really isn’t the time. Taking classes is one thing. But you’re still in your family’s house. Yes many of us have had birds as kids. Doesn’t mean it was the smartest choice for our parents to make. Can it be done? Yes. Should you? No. You have more improtant things to worry about. Birds are encumbering, it’s a fact. They restrict your oifestyle options. Now is not the time for this encumberence on your possibilities. Chris, I understand, I really do. I know I can't rush into this or risk giving any animal a poor home or quality of life. But how does being in my family's house affect this? And I know I have responsibilities regarding both classes and personal life, but doesn't everyone? At every stage in life? Because I'm pretty sure there are people who work 9-5 jobs every day and still manage to maintain a healthy, happy parrot. And I did forget to mention, I have a friend, my age, who attends classes just as I do, and they own a cockatiel from their childhood, and are also looking into conures as well. I'm not trying to argue or deny, I'm just trying to understand. I've done my research, I've talked to professionals, but I just want to know why you personally think I couldn't provide for the bird. First of all, PLEASE IGNORE THE STATEMENT MADE BY MarrMarr of "people here are way too sensitive about bird keeping", as it is one of the most irresponsible and idiotic statements I've ever heard made by someone who actually already owns a pet parrot, and is a member of a parrot forum. THERE IS NO SUCH THING AS "BEING WAY TOO SENSITIVE ABOUT BIRD KEEPING", or "pet keeping" in-general, regardless of the type of pet...Why do you think there are hundreds of thousands of pets in need of homes in this country? BECAUSE OF PEOPLE WITH THE SAME MENTALITY AS MARRMARR...Get mad at me, I don't care one bit MarrMarr, it was totally irresponsible of you to make that statement to a teenager who came onto this parrot forum asking if getting a pet parrot would be right for he and his family right now...THIS 18 YEAR OLD IS FAR MORE RESPONSIBLE THAN YOU ARE ALREADY, JUST BY ASKING THE QUESTION THAT HE DID!!! -Can you keep your bird's main-cage in the "main" room of the house, the room where the action in the house is, the room where most people are when they are home, such as the living room, den, family room, etc.? You cannot keep your bird in your bedroom or a "spare" room where he will be able to hear people are home but will not be able to see them. And even though this will be "your" bird, per se, you cannot put his cage in your bedroom, go to school or work, and make him stay in your empty bedroom while anyone else is home, watching TV or whatever in the living room. He will cry and scream and have socialization issues if you do this. Even if no one is paying direct attention to him, just him being located in the room where people are, where he can see them doing whatever it is that they are doing, will allow him to feel comfortable and content being in his cage and entertaining himself with his toys and such inside of his cage. -Are you able to allow your parrot to get at least 4-5 hours of out-of-cage-time with you or someone in your home every single day? That's the minimum amount of attention and direct stimulation a parrot needs to stay happy, healthy, and to prevent boredom, behavioral issues, and syndromes resulting from a lack of attention, such as feather plucking..
-Do you have a plan if a problem with your current dog arises? The fact is that he is NOT a "non-issue", not by a long-shot. He's never shared his home with a bird before, i don't know if he's ever shared his home with any other animal before, but definitely not a bird, so the truth is that you don't know what kind of issues are going to arise at all. He may become very, very jealous of the bird and become violent towards him, he may exhibit a prey-drive towards the bird, and it may be impossible to have them both out at the same time. In this case, the bird cannot suffer, he cannot be punished by spending all of his time in his cage and not get his minimal 4-5 hours a day out, nor can the dog be punished by being constantly locked inside a crate or a room alone all the time. ***I'm putting emphasis on this issue because it's obvious to me that you haven't put ANY thought into it as all, as you automatically wrote it off as a "non-issue", and as anyone on this forum will tell you, you cannot at all judge how any current pet is going to react or act like when you bring home a new parrot. And just as you don't know how the dog is going to react, you also don't know how the bird will react, he may be aggressive towards the dog, and their beaks can do a lot of damage. Everyone here will also tell you that this is such a common and usually overlooked issue prior to getting a pet bird, that it often results in one of the two pets having to be rehomed shortly after the arrival of the bird. It's not fair to the dog to have to leave his home, he was there first, and it's not fair to the bird to get settled into his new home and then have to leave. So this is an issue that you must sit down and speak about with your family before even thinking about bringing a bird into the house. You must discuss all of the possible issues that could arise and how you will handle them. The other thing that YOU in-particular must think about, since I'm assuming this is going to be "your" bird, meaning you will be his "person", is what will happen to the bird after you graduate from college, or even possibly prior to. You're only 18 now, you just graduated from high school not long ago, but you're not going to want to live with your parents forever, and as I said above, "life happens". So if you meet someone and develop a romantic relationship with them and they want to move-in together, they might have pets already, etc., or if you have to move for a job, etc., what will happen to your bird? These are the things that unexpectedly happen in life my friend, and though you cannot predict them happening or how they will happen, you do have to make a commitment to that bird the day you bring him home! This also goes for ANY ceramic heaters, air purifiers, etc., as they also contain the same stuff as Teflon does (PFE's and such) that will instantly kill your bird. This is a big problem for a lot of people, as they don't realize this until AFTER they get a bird, then they have to spend a bunch of money replacing stuff. Let me just say: this is exactly the response I was looking for. Thank you so much for taking the time to address each of my points, pointing out what I may have missed, and giving me REAL advice rather than just saying what everyone else has said (even though I do value what everyone has said.) I'll definitely make sure to double-check and prepare for everything you listed here, especially the issues regarding my dog. I hadn't thought about whether the bird itself would be comfortable living with another animal under the same roof, and I would never want to force either of them into conditions that, to them, are not ideal. The only reason I wrote it off as a non-issue is because we've had small animals in the house before, and he's never been an agressive dog... But I see what you mean, and I'm glad you pointed that out. I'll definitely consult the family on this one. Every member has agreed to this commitment (even though, yes, it will be my bird) and are, in fact, eager to interact with a lovely new addition to the family. I've been browsing multiple pet supply stores, planning for food, toys, and cages, and have budgeted appropriately. I even have money set aside for emergency situations. And I do realize that all of you here are just making sure that I don't rush into a commitment that I won't be able to handle, but that's exactly why I came here. I do believe I can take proper care of a parrot, and I'd really like the chance to do so. I have always been an animal lover, and would never want to do bad by any creature. I know life gets in the way, trust me, I do. But I know that people, such as everyone on this forum, has been and are willing to sacrifice their time to care for their own parrot, no matter the breed. So again, thank you. I really, really appreciate your help! If I can, I'd just like to ask one question: is a conure the right type to look into? EllenD made some excellent points. If you really want a sun conure. I suggest you visit one or know someone with an adult sun and see if you and your family can handle the high pitch of their scream. Same goes from green cheeks, although they aren't quite as loud or high pitch... but' I have heard some come close to sun conure pitch only because it was trying to mimic the sun's call. So my advice would be take a family outing so everyone can experience the noise level since they will have to live with it too. Green cheeks, Pyrrhura species, is smaller than the sun, Aratinga. So there is a size factor. From my own personal experience, the green cheeks seem to be nippier than the suns but that can always be worked on and there are plenty of green cheeks owner on here to help you with that. Thanks, Doubletake. I'll see what I can do! I'll contact the breeder and ask if they're any possibilities to do a 'meet-and-greet', so to say.